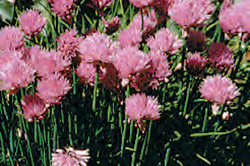 Site: Chives thrive in full sun and well drained moist soil rich in organic matter. They tolerate light shade, but 6 - 8 hours of direct light is best. Growing: Space the clumps 9 inches apart and 2 inches deep. Divide and replant clumps every 3 or 4 years. Division is best done in spring. Replant new clumps in soil enriched with organic matter, such as fine compost. Water the plants regularly especially during dry spells. Pot in autumn for indoor supply. Can be grown indoors in a sunny window. 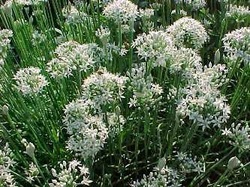 Over-fertilizing can be detrimental to chives as this plant is not a heavy feeder. A soil rich in organic matter should provide sufficient nutrients. Harvesting: Cut the grassy leaves to within an inch of soil level - never snip off just the tips and never leave the flower-heads to open if you want a regular supply of leaves. Cut flower stalks off at the soil line once they finish blooming. This will prevent the plant from forming seed and keep it more productive. Culinary Uses: This is an herb with many uses and universal appeal and is a must for any herb garden. The flavor difference between dried chives and fresh chives is significant. The mild onion flavor can be added to potato salad, stuffed eggs, soups, salads, omelets, cream cheese and sauces. This is an herb needed in everyone's kitchen. Much of its value is lost by drying - for winter use, grow a pot or two indoors or freeze by the ice-cube method.